You can definitely feel autumn creeping in. Yesterday felt great outside and today feels even better. The temp is about 59 right now and there is a nice chill in the air. It’s nice and quiet here at my desk in my office. I point that out because there is a vent across the room that is usually blowing directly on me right about now. The dregs of summer heat may have finally passed so the AC is not constantly running anymore. Though our vegetable garden may be done for the year, there are still some other plants that are very much alive around the yard, mainly the herbs. I snapped photos of a few of them over the weekend to share this week. This is a new herb we planted for the first time this year. 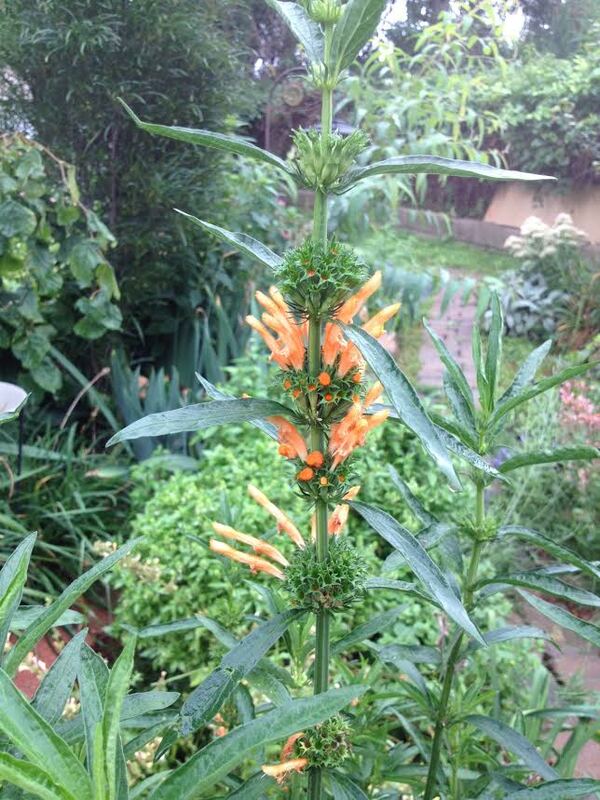 It’s called Lions Tail or Leonotis leonurus. It produces leonurine, a psychoactive component serving medicinal purposes primarily in Africa where this plant is a native. Who knew? Here it is mainly an ornamental plant but its leaves can be dried for tea.